The main upgrades on the 2016 Honda CRF450R motorbike are around it’s stability. They have overhauled the fork and shock linkage and made small improvements to the suspension. They have this time manufactured a bike with great straight line stability, aswell as excellent cornering. Powerwise it feels very similar to the earlier model. The 2016 model is also the only 450 bike on the market with â…ž inch Renthal handlebars. There is a map switch button on the right hand side handlebar allowing you to easily switch power modes, allowing you to change between 3 engine power maps easily, whilst riding. The earlier model didn’t feel too great top speeds, this has been improved by utilising the Honda Progressive Steering Damper, or HPSD. The HPSD helps the suspension and increases steering accuracy when cornering, accelerating and braking. Initial tests by experts showed the HPSD this latest model keep in a straight, without affecting it’s cornering abilities. The 2015 model had great cornering ability, as does the 2016. The power is very smooth and the bike’s weight helps this feature massively. The suspension overall is excellent again, as with previous models. This again adding to it’s excellent cornering ability. Another excellent feature is the air forks, so changing the shock for larger, or smaller riders is extremely easy. 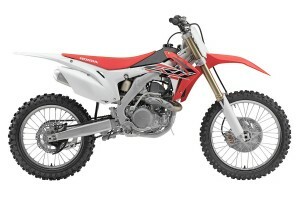 In essence the new CRF450R has very useable and smooth power, improved balance / stability and is one of the lightest 450s around. It does however have a small feel about it for taller riders. With a starting price tag of just under $9000, it will be interesting to see how this machine competes.